Bayou Rentals has been servicing the tri-city and surrounding areas since 1985. We carry a full line of quality outdoor power equipment for home, landscape professionals, or contractor use. We are an authorized servicing dealer for Scag Power Equipment, Go-Devil Engines, Boss Drives Mud Motor, and Stihl Power Tools. We are certified in Briggs & Stratton, Kohler, Kawasaki, and Honda engines. We are conveniently located at Hwy 90 at Lipari Street in Patterson, LA. The X Lite Muffler Is our newest model for your 23 HP Briggs & Stratton Vanguard engine. The X Lite is made of American 304 Stainless, tig welded, and CNC bent to provide a perfect fit, and bulletproof construction. This muffler is guaranteed to improve throttle response, low end torque, and top end performance. It has been designed with slip fittings, and a rubber mounted bracket to eliminate vibration issues. * Upgrades offered on new or customer supplied engines. * Dyno Sheets are provided with each Modified Engine sold. * Modified Mufflers also available. Come by and check out our selection of BOSS DRIVES & GO - DEVIL Mud Motors. The world's most advanced shallow water outboard, featuring marine quality castings and gearing. The Mercury Bravo Cone Clutch is proven Reliability for F-N-R in Boss Drives motors. Great for getting to those hard to reach hunting and fishing spots!! Now offering 2 & 3 Blade Props!! Test run the props to see which works best for your boat!! Authorized Go-Devil ~ Surface Drive Dealer and Service Center. Come see our large selection of Go-Devil's and Surface Drives in stock now! Come to Bayou Rentals & Repairs and Check out our BOSS DRIVES Mud Motors - See the DIFFERENCE FOR YOURSELF! *****BOSS HOSS 75 HP IS NOW AVAILABLE!! CALL US TODAY! Xtreme Conditions Require Xtreme Performance - 2X Power of other 'Stock' Engines. The Mercury Bravo Cone Clutch is proven Reliability for F-N-R in a Boss Drive motor. We also have MERCURY & RAPTOR Props that fit on Boss Drives, Gator-Tail & Mud Buddy. We have Mud Buddy Big 2 Blade (12.25 x 10) in STOCK! WHEN THE GOING GETS TOUGH * Get a GO-DEVIL! Authorized Go-Devil and Surface Drive Dealer. Come see Our large selection of Go-Devil's and Surface Drives in stock now!!! 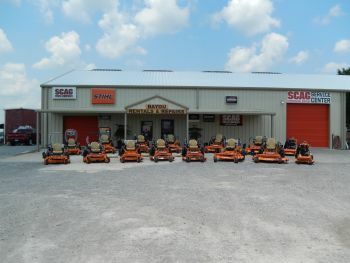 STOP BY AND SEE OUR SELECTION OF SCAG MOWERS! WE HAVE RESIDENTIAL AND COMMERCIAL MOWERS IN STOCK! 0% FINANCING AVAILABLE FOR 48 MONTHS! WE ARE HAVING A SALE ON CHEETAH 48' VELOCITY DECK WITH A BRIGGS AND STRATTON ENGINE! SCAG MOWERS ARE MADE IN THE USA!!! The CHEETAH has a suspension system in the seat and foot plate that allows for a smooth, comfortable ride. Take a close look at our mowers and you can see the difference. Top quality components, heavy-gauge steel, and precisely engineered parts are assembled by expert hands to create the most reliable mowers made. *44 HP Briggs & Stratton Vertical and Horizontal Shaft mud motor engines are now available at Bayou Rentals and Repairs in Patterson LA. All engines are modified, tuned, and dyno-tested to verify performance numbers. Dyno sheets will be provided with each engine sold. 44 & 48 HP Modifications are offered for new or customer supplied engines. Our kits are real world tested, and horsepower gains are verified. Our kits do not sacrifice bottom end torque, mid-range acceleration, or top end performance. Don't spend money on a staged kit, or modifications that do not verify torque and horsepower gains. *Stock* 35 HP Briggs & Stratton engines are also available! Please call us at 985-395-6183 for pricing!